We crave expression of feeling, as proven by our incessant need to construct emotional representation in our typing. Remember <3 ? Then it got exciting when we got the red heart. Now we have broken hearts, beating hearts, and rainbowed hearts, but you see my point. Words are never enough. So, my dear instructional designers, trainers, and facilitators out there, why do we settle for cognitive learning instead of blending it with affect? Probably because it’s really hard. It’s rarely difficult for the writer of the materials, but when the material gets used by other trainers, coaches, and facilitators, the words get lost in translation. 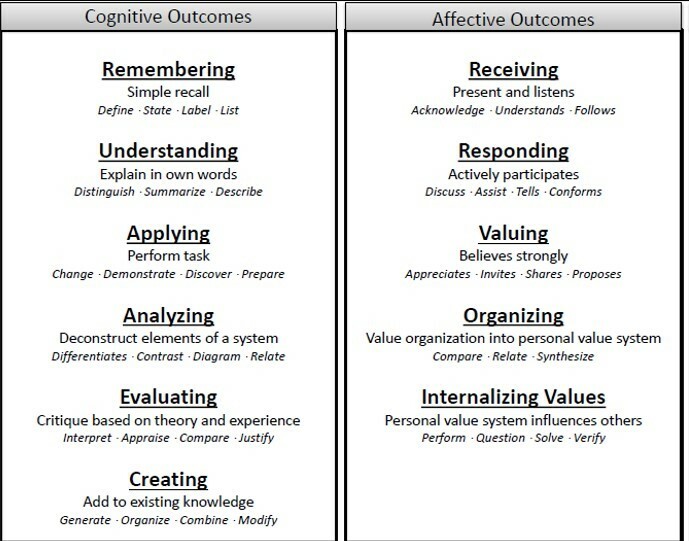 So how do we clarify the emotional outcomes we need to achieve within our learners? Any instructional designer or experienced writer worth their salt knows Bloom’s cognitive taxonomy backwards and forwards, and can splice, feed, layer, and scaffold to their heart’s content. So why is it so hard to do that with Bloom, Krathwohl & Masia’s affective taxonomy? First thing we have to do is forget the idea of measurement. Yes, that’s all right. We cannot effectively measure behaviour and value systems; all we can do is provide the opportunities. Both the participant group and the facilitator has to have an expectation of the outcomes. So what do you say? Affect? Emotional Intelligence? Goals? Value System? All of these are massively loaded terms that can cause more problems than they are worth. Something I’ve been doing is using the term mindset and using a gerund version of the active verb to indicate an on-going process rather than achieving an outcome. Objective: Explain unique challenges of first responder careers. Mindset: Appreciating the nature of choosing a potentially stressful career. As you can see, the objective is measurable, but that can be done in mere minutes with a brief overview from the facilitator and an outline of challenges to represent assessment. Or if we want to go really wild, perhaps interview different first responders to hear first-hand the challenges they face. However, that doesn’t necessarily engage their value system. The facilitator’s true challenge is to help the learners get to a point where they not only acknowledge that first responders have stressful careers, where they not only share with other perspectives that may be in disagreement with their own, but appreciate within their personal value system what it takes emotionally to purposefully select a stressful career. Just because a trainer or facilitator is an expert in a topic has approximately zero connection to their ability to engage the learner on an affective level. I have evaluated, peer reviewed, and observed too many highly qualified individuals who made me want to want to stick a pencil in my eye to think content expertise is related to learning outcomes. What truly floors me though, isn’t that we see a lot of poorly developed trainers and facilitators. It is that administrators and managers put the blinders on that it’s their responsibility to either verify effective learning strategies or provide the training. Here’s where a host of fields can help improve the learning engagement. As I have said in the past, don’t try and do everything at once, but definitely start with one and work it death. Figure it out. Test it. Improve it. Rinse and repeat. However, one thing I can promise you, if it’s not very clearly articulated in the writing, they don’t have a hope of understanding it, let alone having it engrained enough to ensure others are truly exposed to the affective learning experience. It’s not about measurement. Listen to their stories instead. No, that was not a suggestion to make a qualitative study. Just put down your tools and listen. Keep it simple. Be clear. Anybody should understand what you’re describing. Empower people to reach more deeply in themselves to be better at helping others. These mindsets towards affective learning can help us ensure that we effectively represent it in materials to be scaled with other trainers and facilitators. Crossposted in LinkedIn account of Marian Willeke.